Many online poker sites allow transactions using the original Bitcoin (BTC) crypto-currency, but there are also a few that work with Bitcoin Cash (BCH) as well. Bitcoin Cash was forked off of the existing Bitcoin blockchain at the beginning of August 2017, and it’s a completely separate coin notwithstanding that it shares part of its name with its ancestor. If you held any Bitcoin at the time of the fork, then you should have also received Bitcoin Cash in an equivalent number to the amount of BTC you owned on Aug. 1. It's now also possible to purchase BCH from a number of exchanges. Bitcoin Cash was created to address significant problems with Bitcoin. Miners fees, which must be paid to ensure the speedy transfer of money, have sometimes been sky-high. In some cases, moving bitcoins around cost in excess of $50. This has negated some of the rationales for using virtual currency in the first place: low fees and the elimination of delays. Bitcoin Cash was intended to address these issues by increasing the size of blocks – that is, units of ledger data – from 1 MB to 8 MB. Larger blocks cut down on competition for blockchain space and thus mean that users don't have to pay as much to miners to incentivize them to include transactions in the next block. While many predicted doom for the new altcoin, Bitcoin Cash has thrived in the months since its deployment, appreciating from around $300 per coin at its debut to more than $1,100 as of June 6, 2018. This is partly due to strong advocacy efforts from prominent names in the crypto space, like Roger Ver and Calvin Ayre. However, the main reason for BCH's success is that it actually delivered what it promised: fast payments and low fees. At the time of this writing, average Bitcoin Cash miners fees are in the ballpark of 0.10 per transaction. These characteristics make Bitcoin Cash ideal as a deposit and withdrawal mechanism for online poker and other forms of internet gambling. If you're not exactly sure how to start using this innovative form of digital cash for your real money online poker and gambling needs, then skip down to our detailed instructions, with screenshots, on how to set up your wallet, create an exchange account, and make deposits and cashouts from your favorite betting sites. If you're entirely new to the crypto space but are already an avid real money online gamer, then it might be wise to consult our guide to Bitcoin gambling and our page describing Ethereum gambling sites before settling on which crypto coin you want to focus on. If, on the other hand, you're a veteran in the Bitcoin Cash world but haven't yet explored your options for internet gaming with the currency, then check out the site reviews below to find an online gambling home that's BCH-friendly. Ignition is not only the largest online poker site that accepts Bitcoin Cash, but it also has the most traffic of any internet poker organization operating in the U.S. and Australian markets. Upon creating an account and funding it for the first time, you'll become eligible for a 100% up to $1,000 poker bonus that's worth 30% rakeback on tournaments and SNGs but a bit less in cash games. The way the bonus payouts are structured, you'll actually see a greater return on the initial phases of it than in the latter stages, so it's perfect if you're only willing to make a small deposit. The most notable feature of Ignition is its anonymous tables. No user is identified by anything other than a randomly generated player number, so it's impossible to track how anyone plays over more than a single session. This makes casual users feel more confident because pros aren't able to deploy sophisticated software to get an edge. As a consequence, games here are quite a bit softer than at competing poker rooms. Ring games are listed up to $10/$20 in No Limit Texas Hold'em, Pot Limit Omaha, and Pot Limit Omaha/8. LHE and LO8 action can be had as high as $30/$60. Zone Poker is a type of fast-fold cash game wherein players who fold their hands move right away to another table to start a new round. The pace is brisk in Zone, and you can see hundreds of hands per hour. NLHE and PLO sit-n-goes exist from $1 + $0.05 up to $200 + $14, and there are a variety of table sizes and game formats to choose from. MTTs at Ignition guarantee a total of more than $1.5 million per week, with the largest being the $150 + $12 $100,000 Guaranteed on Sundays. Every few months, there's a tournament series to whet your appetite for multi-million dollar prize pools with new events firing off every day. The newest addition to the Ignition poker offerings is called Jackpot Sit & Go. These three-player contests use a random mechanism to decide how large the prize pool will be. It can reach as high as 1,200 times the buyin! Because the stacks are short and the levels fly by quickly, each game takes no more than 10 minutes to complete on average. If you like casino games, then there are hundreds of them for you to sample here, and you'll even get another 100% up to $1,000 bonus to do so. You can access both the poker room and the casino from your mobile device on the Ignition website, but the web-based poker interface only has cash games and Jackpots – it lacks tourneys and regular sit-and-goes. Click on the banner above to go to Ignition and open up your account. If you'd like to get more info on the site first, then browse over to our comprehensive Ignition Casino Poker review . The only shortcoming of Ignition is that it lacks a sportsbook and racebook, but the next site on our list remedies these deficits. Bovada is housed on the same PaiWangLuo Network as Ignition is, which means that the poker tables are identical. You'll be able to enter the same cash games, sit n' goes, and tournaments on either of the two sites. What makes Bovada.lv different is the fact that it has a sportsbook and racebook in addition to a casino and poker room. On the negative side, the Bovada poker bonus is only 100% up to $500 although the rakeback equivalent (in SNGs and MTTs) is the same 30% as the Ignition bonus. The sportsbook grants you a 50% up to $250 bonus with a low 5x rollover requirement (on both the bonus and deposit amount). You can use your real money and bonus funds to bet on all kinds of contests from the popular, like NFL and NBA, to the obscure, like handball and Gaelic Games. Maximum bet limits range from $5,000 on NFL spreads to just a few hundred dollars on some of the more niche leagues. Through the Bovada Live Betting interface, you can put more action down even after the matches you're interested in have already started. The Bovada racebook has races from nearly 200 tracks. Most of them are located in the United States, but there is a selection of British, Irish, and South African tracks listed also. The maximum amount of cash you can risk on each single wager varies from $100 to $1,000 depending on the bet type and the track. The racebook is covered under the same 50% up to $250 bonus as the sportsbook; racing and sports bets are both equally valid for clearing it. The Bovada casino has a 100% up to $1,000 bonus, and you can take advantage of it three separate times for a total of $3,000 in complimentary dough. It has the same hundreds of titles that are present in the Ignition Casino; however there are extra features active at Bovada. There are casino leaderboards that allow you to compete against other players to attempt to win easy-to-clear bonuses and a live dealer area with games operated by real human dealers.. Follow the above banner link to join Bovada today. We've also prepared a thorough Bovada Poker review for your enlightenment. Americas Cardroom is a respectable poker operator that has added dozens of crypto-currencies to its cashier, including Bitcoin Cash. It offers new players a 100% up to $1,000 bonus (20% rakeback rate) as well as a free $50 credit to sample the games. ACR, on the Winning Poker Network, is open to residents of the United States and most other countries around the world. The range of stakes available for NL Hold'em, PLO, and PLO/8 goes from $0.01/$0.02 up to $25/$50. There are quite a few limit games spread too: Limit Texas Hold'em, Limit O8, Seven Card Stud, and Seven Card Stud Hi-Lo. They're listed up to $30/$60 and, in some cases, beyond. There are two non-standard sit-n-go formats at Americas Cardroom: Jackpot Poker and SNG 2.0. Each of them contains random elements that allow the prize pool in any given game to grow to epic proportions. Plenty of normal SNGs are provided too at buyins both low and high, and there are step satellite sit-and-goes to major live tourneys. Tournaments are a true specialty of the Winning Network. It has the biggest “Sunday Major” event open to Americans: the $200 + $15 Sunday Special, which guarantees $150,000. Every few months, there's a Million Dollar Sunday that lets you contend for a share of a seven-figure prize pool. Moreover, ACR runs regular MTT series, and it sometimes provides leaderboard prizes to those who perform the best over the entire schedule. Two leaderboards pay out tens of thousands of dollars in cash and satellite tourney entries each week to the top ring game and SNG players. They're called The Beast and Sit & Crush respectively. Further rewards come through the Elite Benefits program, which hands out free goodies depending on the number of points you accumulate while at the poker tables. To get started at Americas Cardroom, click through the above banner. For more information before you sign up, look at our detailed Americas Cardroom poker review. Sportsbetting.ag is a multi-product gaming site has been adding crypto coins to its cashier slowly but surely, and Bitcoin Cash is now fully accepted. Upon your first deposit at this Chico Poker Network partner, you'll become eligible for a 100% up to $1,000 poker bonus. This bonus is worth 20% rakeback. You can play cards from penny stakes up to $10/$20. The main games are NLHE, PLO, and PLO/8. There are also a few tables of LHE and Limit Omaha Hi-Lo, but traffic is pretty thin in these formats. SB.ag spreads fast-fold poker, which it calls “Boost,” though it's only available in NL Hold'em, and, only micro-stakes Boost pools are offered. Sit & Gos are fairly good here, with contests offered between $1.50 and $215 as well as the lottery-style Windfall tournaments. MTTs are mostly small affairs for low buyins although there is a $50K guaranteed tourney every Sunday that's boosted up to $100K on the final weekend of every month. Within the sportsbook, you'll see football, baseball, basketball, and all your other favorites to bet upon. There's a Live Betting section too so that you can place wagers while the contests you love are underway. You can obtain a 50% up to $1,000 sports bonus.with a 15x rollover. Don't neglect the $25 free play and 7% rebate available in the racebook while you're at it. Sportsbetting also has a pretty robust casino too with close to 200 titles, including live casino tables. The casino bonus is a 100% up to $1,000 deal, which you can use three separate times on three deposits for a total of $3,000 in complimentary bonus cash. The wagering requirement is 40x. Click through the banner above to sign up at Sportsbetting.ag. We've written a review of Sportsbetting.ag that contains a lot of interesting, factual info. We've put Intertops last on our list of Bitcoin Cash online gaming sites because the transaction limits are a bit stingy. Don't take this to mean its a second-rate company at all; Intertops has been around for more than 30 years and is the main site on the Horizon Poker Network. The poker bonus is 200% up to $1,000, and you'll score yourself a 36% rakeback deal too when you sign up through our links. Between the bonus and RB, your rate of return could exceed 60% cashback, which is exceptional in the current internet poker scene. Traffic is a bit light at the Intertops poker room, and it's pretty hard to get in a table higher than about $0.25/$0.50. The games that see action are NL Hold'em, PL Omaha, and PL Omaha/8. SNGs hardly ever run, but the multi-table lobby contains dozens of events every day albeit at mostly low stakes. There are quite a few tourney overlays, however, so Intertops is a fine place to pick up some extra value. The sportsbook will welcome you with a 50% up to $200 bonus when you deposit with crypto, and there's a 4x rollover required. Actually, there are two other bonuses that you can choose from, but they're all smaller than $200 although their percentage matches are higher. As one of the most respected online sportsbooks around, Intertops maintains a comprehensive menu of betting options and markets, so you'll find no lack of opportunities to deploy your bonus funds. There are three separate casinos at Intertops: the Casino Classic, Casino Red, and Poker Casino (contained in the poker client). The bonuses associated with these divisions are 100% up to $100, 100% up to $100, and 100 free bets on table games respectively. Due to the fact that there are multiple casinos, you have a nearly unparalleled selection of games to enjoy, provided by some of the leading names in casino gaming, like BetSoft and Realtime Gaming. Set up your Intertops account by following our banner link above. Or you can peruse our thorough Intertops poker site review page to learn more first. Before you can make a deposit at a Bitcoin Cash gambling site, you must first obtain BCH somehow. It may be possible to set up a private purchase, but it's probably most convenient and easy to buy your Bitcoin Cash from an exchange. There are a number of exchanges that deal in Bitcoin Cash, and we recommend Coinbase, the largest crypto-currency marketplace in the world. It's licensed in the United States, but it's open to customers in many other countries, like Canada, the United Kingdom, and Australia. After you complete your purchase at Coinbase, you'll probably wish to move your coins to a separate wallet. For all its advantages, Coinbase doesn't let you control the private keys to your BCH; it has custody of them on your behalf. This means that your money is subject to all the restrictions and rules that the firm follows, and it takes an unfavorable view of gambling. In order to prevent any possible problems from cropping up going forward, we strongly counsel you to use a third-party wallet as an intermediary both when transferring BCH to online gaming sites and when cashing out your winnings. One of the most trusted wallet providers is blockchain.com. 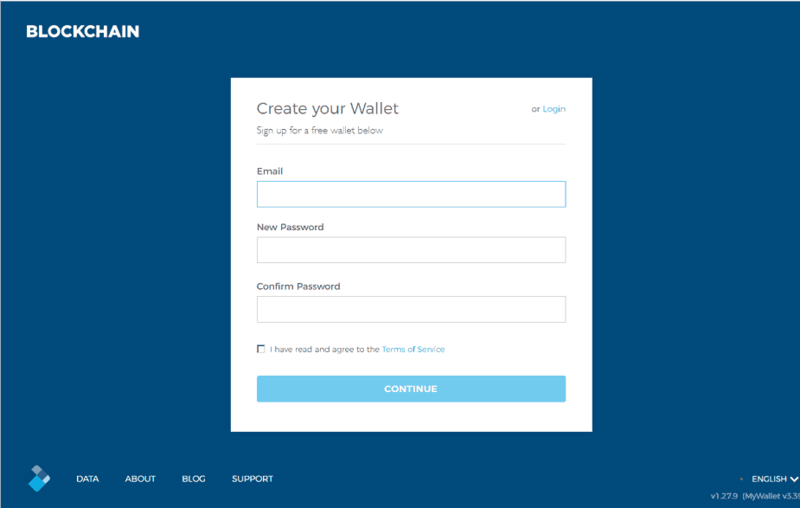 The blockchain.com wallet started out supporting only old-school Bitcoin, but it has since expanded into Ethereum and Bitcoin Cash. You always have possession of the private keys to your Bitcoin Cash at blockchain.com. 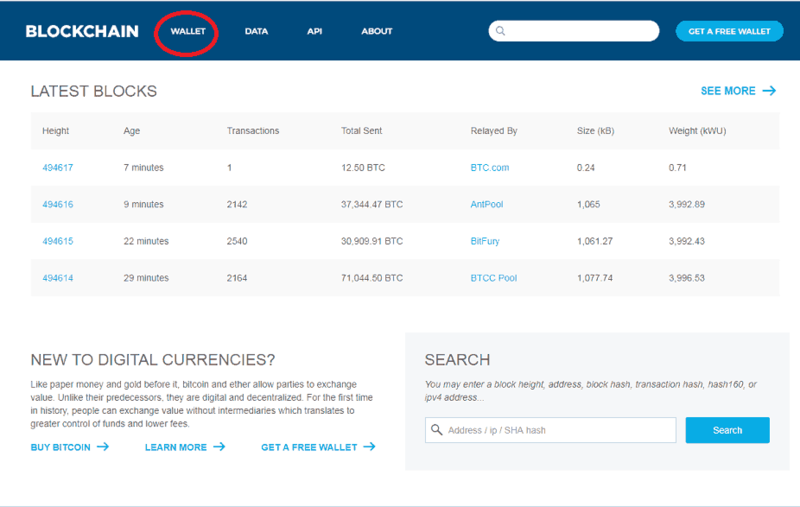 In the event that the website ever goes down (unlikely) , you can import them into another wallet and continue on without worry. 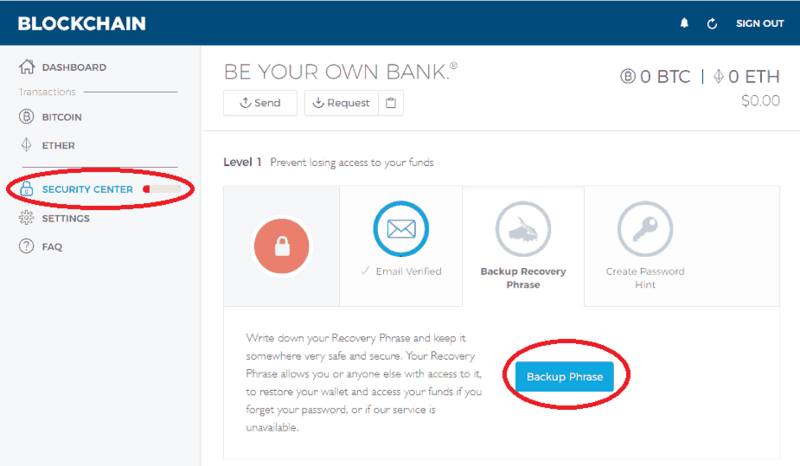 To set up your Coinbase account, click on our link. We have an arrangement with the company whereby our readers get a complimentary gift of $10 worth of Bitcoin upon their first purchase of $100 of crypto-currency. You don't need to fulfill this $100 requirement with a single transaction; the free $10 will trigger automatically whenever your total crypto purchases reach the $100 mark. Full disclosure, we also get $10 when you fulfill the purchasing criteria. Complete the fields of the signup form. Then click on the “Sign Up” button. 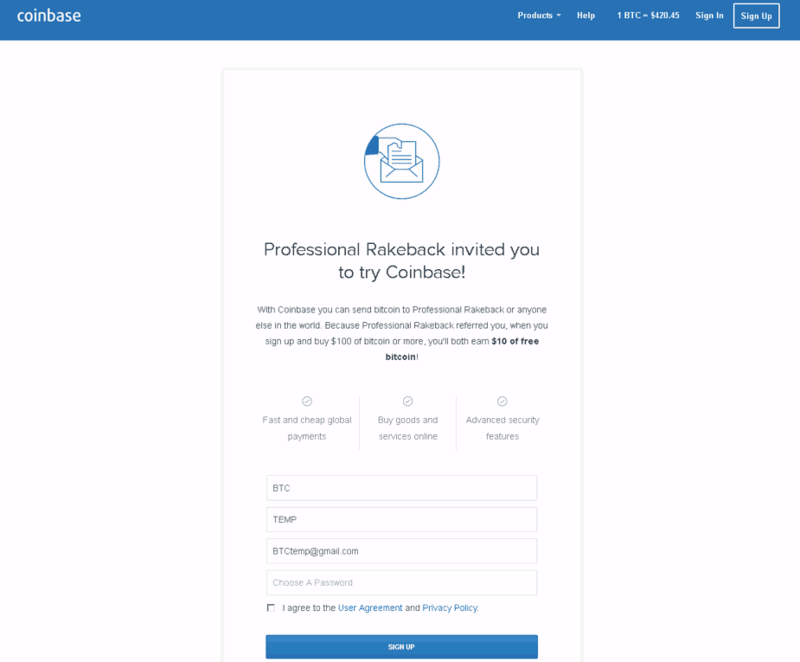 Coinbase will send you an email for verification purposes. Click on the link in the email message to proceed. Next, you'll have the option to enable two-factor authentication. This is a security precaution that will send a numeric code to your phone every time you try to log in. You'll have to enter this code in before you'll be granted access to your account, which means that hackers won't be able to compromise your balances at Coinbase unless they break into your phone too. You'll be prompted to link your bank account to your Coinbase account by providing your routing and account numbers. Buying with funds from your bank is the main way of acquiring crypto at Coinbase, and it takes a few days for the transaction to clear and your coins to be ready. If you wish to get BCH nearly instantly, then you can also add a debit card to your account although there is a surcharge for this service. Now it's time to stock up on Bitcoin Cash. 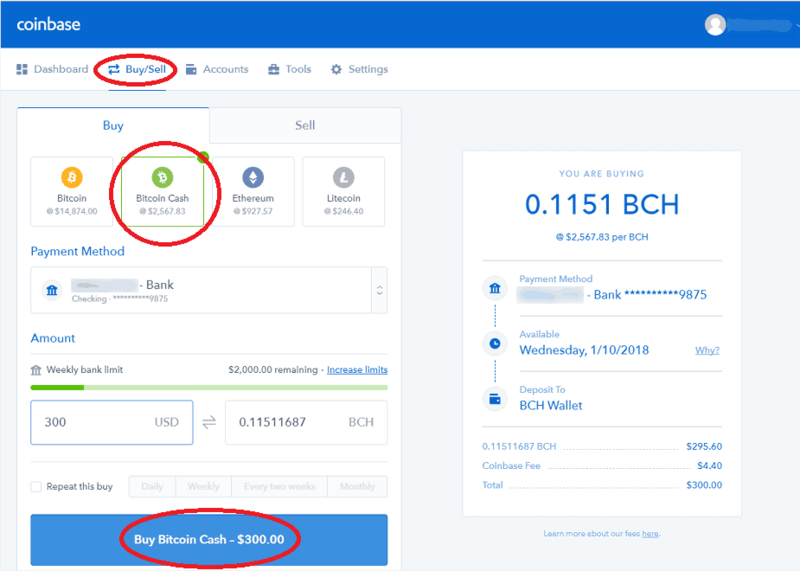 From the top menu of the Coinbase website, choose “Buy/Sell.” Then select Bitcoin Cash. Next, pick your payment method from the drop-down list. Enter in the amount of Bitcoin Cash you want to buy. 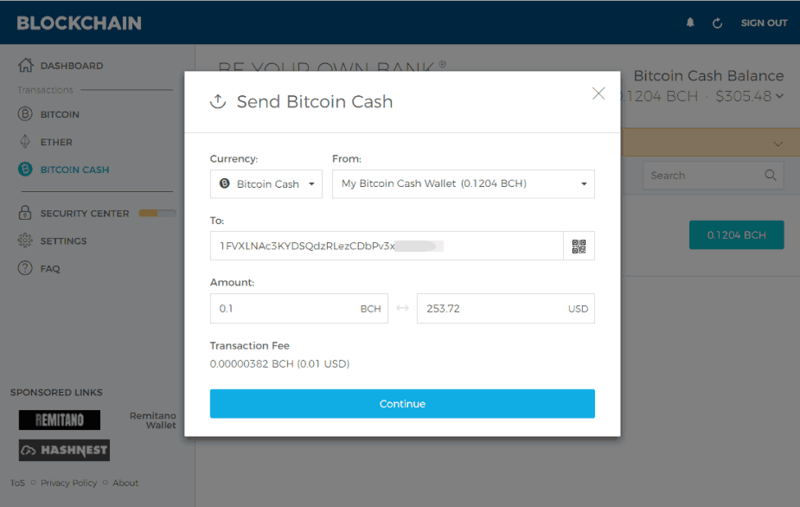 You can either type in the BCH value directly or fill in the amount of USD you wish to spend and have the system calculate the appropriate number of BCH. When you draw the necessary funds from your bank account, you'll be levied a 1.49% fee (with a $0.15 minimum). However, if you use a debit card for speedier service, then you'll have to fork over 3.99%. The amount of any fees along with the timeframe for transaction completion will be shown on the right of your screen. If all looks OK, press “Buy Bitcoin Cash” at the bottom of the screen. Then click on “Sign Up” near the middle of the page. Click “Get Started,” and you'll be inside the main wallet display. Blockchain.com will have sent you an email to verify your account. Follow the link given to you, and everything should be good. 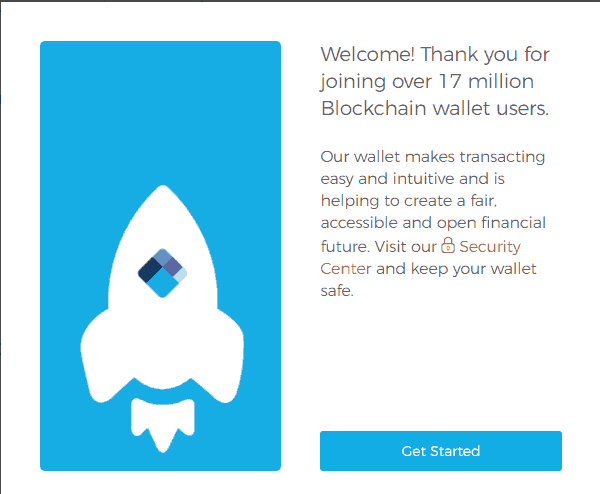 Before starting to use your new blockchain.com wallet, there's one step you ought to take to spare yourself potential aggravation in the future. We encourage you to back up your recovery phrase without delay. This 12-word string serves as a way for you to import your coins into another compatible wallet (there are many) in the event that something goes wrong with blockchain.com. It's also your only line of defense if you lose your login credentials because blockchain.com doesn't have any way to restore inaccessible coins to you. This is part of the responsibility of controlling your own private keys. Your backup phrase has specialized use cases also, like being able to claim airdropped and forked coins, but we'll leave those to the true crypto-currency veterans. For now, suffice it to say that keeping a copy of the recovery phrase in a safe place doesn't cost you anything and could come in handy in future. Follow the instructions given. 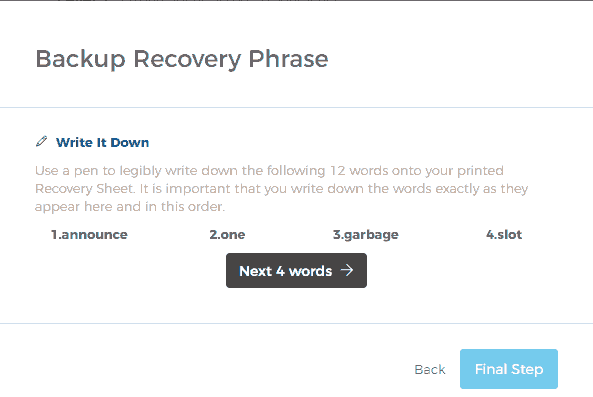 You can print out a recovery sheet if you wish, but this isn't strictly necessary. Writing the words down on any piece of paper is what's important here as long as you keep that paper safe. 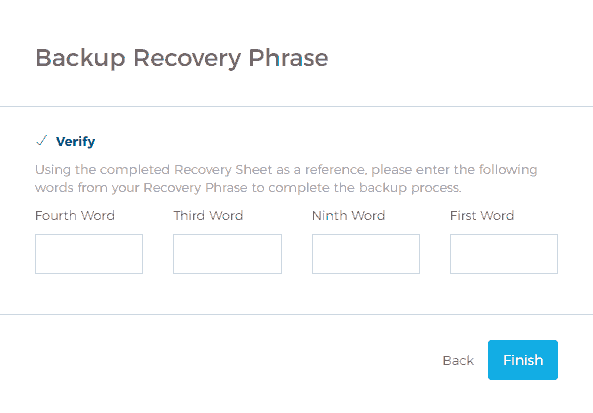 When you start the Backup Recovery Phrase process, you'll see four words appear on your screen. Write them down, and then continue through to the next four words. After three such screens, you'll have written down all 12 words of the backup phrase. When you're finished, you'll have to enter some of the words in a verification window. The site will ask you to input the few of the words, identified by order, i.e., the fourth word or the ninth. Once you enter them in correctly, you'll be done with this procedure. Remember to keep these 12 words safe as there's no telling if and when you might need them. 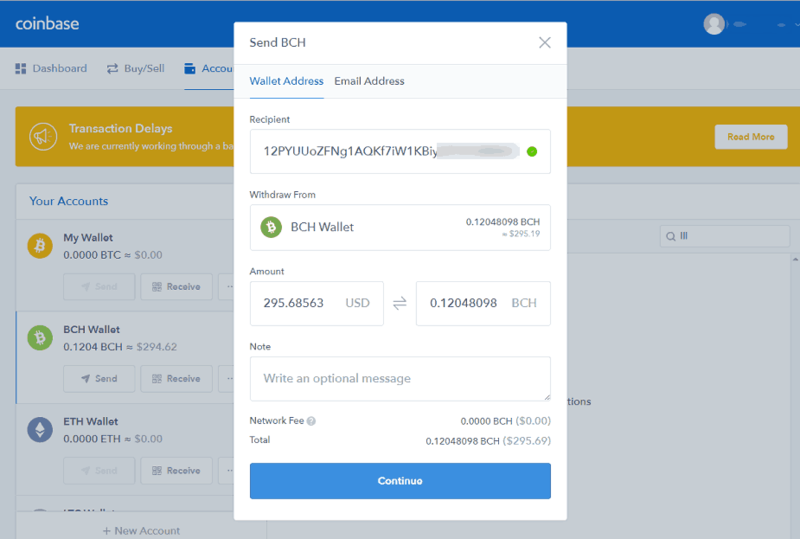 Before depositing at any BCH online gambling site, you should transfer your coins to your blockchain.com wallet. 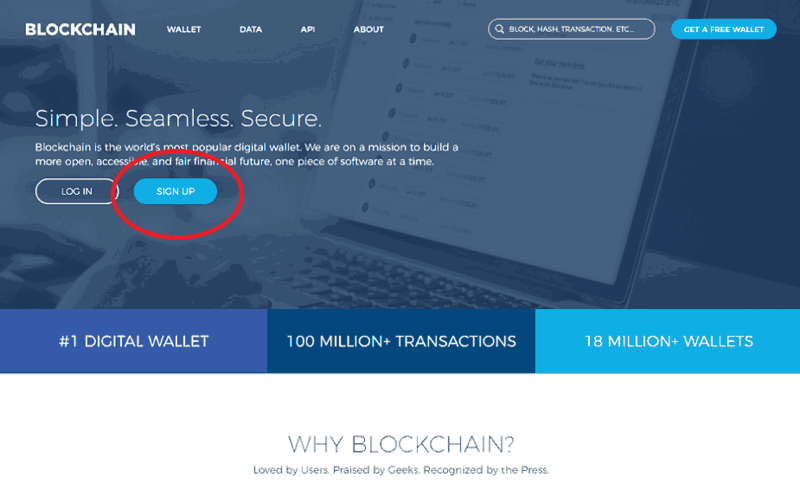 Log into your blockchain.com account, and press “Request” at the top of the page. Then select “Bitcoin Cash” from the menu in the window that appears. An address will be shown in both QR and text formats. 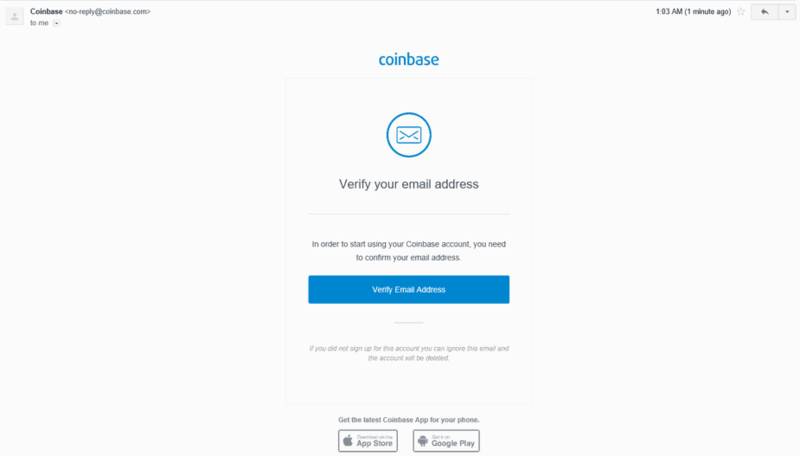 It's this address that you'll be entering into the send dialog at Coinbase. In the “Recipient” field, copy-paste the address from blockchain.com. Then enter the amount of BCH to send. You can enter the number in USD if you prefer, and Coinbase will calculate the amount of Bitcoin Cash this equals. Coinbase will charge you a fee, called a network fee, which should be less than $1. This fee is paid to BCH miners who verify transactions and ensure that the public blockchain ledger is up to date. When you're finished typing in all the required info, click the blue “Continue” button. When you go over to the history sections of both Coinbase and blockchain.com, you'll be able to observe the status of the transaction you just made. It usually takes around 10 minutes for a confirmation on the Bitcoin Cash network, so you won't have to wait too long. Now you can move your funds from blockchain.com to your poker or other gambling site of choice. You'll have to start the depositing process at the site and follow the directions – they vary a bit from site to site. Once you get a receiving address and the amount of BCH to send, go to your blockchain account and click “Send.” Make sure you have “Bitcoin Cash” selected as your currency, and paste the relevant data into the appropriate fields. Again, you'll have to pay a small miners fee to ensure that your transaction is included in the next couple of blocks. Hit “Continue” when ready. The money will hit your poker room account, and your balance will increase by the appropriate amount of USD (or EUR or GBP or whatever currency you're using). You can play and bet like normal. When you feel like cashing out, go back into blockchain.com and click “Request.” You'll get an address to send your profits to, just like when you sent from Coinbase to blockchain.com, but it will be a different address each time. Copy this address into the withdrawal screen at your gambling site, and submit your payout request. It might take a while to get your BCH back into blockchain, but in general, crypto-currency withdrawals are faster than the other payment channels featured at online gaming entities. 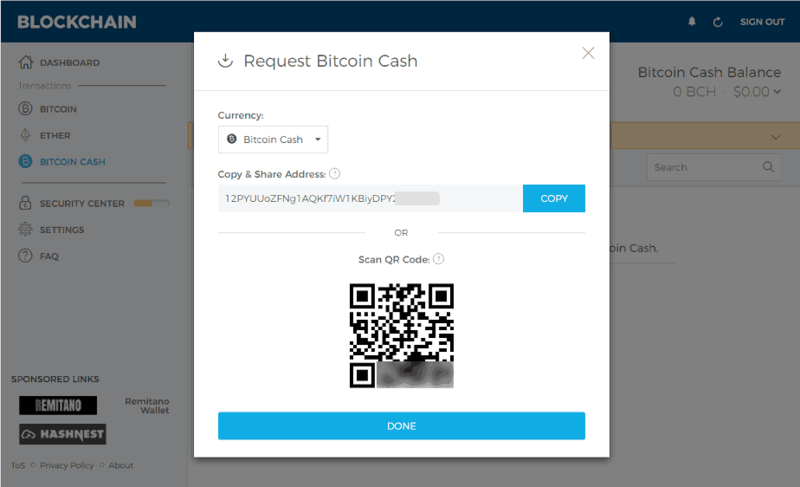 You can move your money around to other providers of goods and services directly from blockchain.com as long as they accept BCH, but if you would rather have dollars in your bank account, then you need to sell your Bitcoin Cash at Coinbase. Log into Coinbase, and go to the “Accounts” tab at the top of your web browser. Click on “Receive” next to your Bitcoin Cash wallet. You'll see an address that you can copy back into the sending interface at blockchain.com. 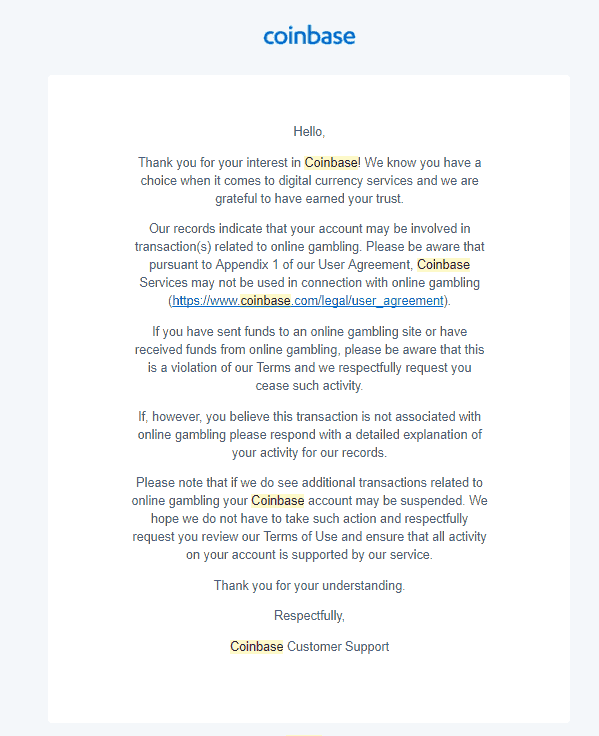 The procedure for sending from blockchain.com to Coinbase is identical to that for sending from blockchain.com to a gambling site, so do the same things you did before, this time using the address from the exchange. Coinbase waits for six network confirmations before allowing you to trade your BCH for USD, so it might take around an hour before you can proceed. Once the Bitcoin Cash has been fully confirmed in Coinbase, choose “Buy/Sell” at the top of the screen, and select Bitcoin Cash from the “Sell From” menu. Highlight your bank account in the “Deposit To” field. Fill out the amount of Bitcoin Cash that you want to sell in either dollars or BCH. Coinbase charges a 1.49% fee with a min fee of $0.15 for withdrawals to your bank. Assuming the summary shown to the right meets with your approval, click on “Sell Bitcoin Cash” to confirm your payout. 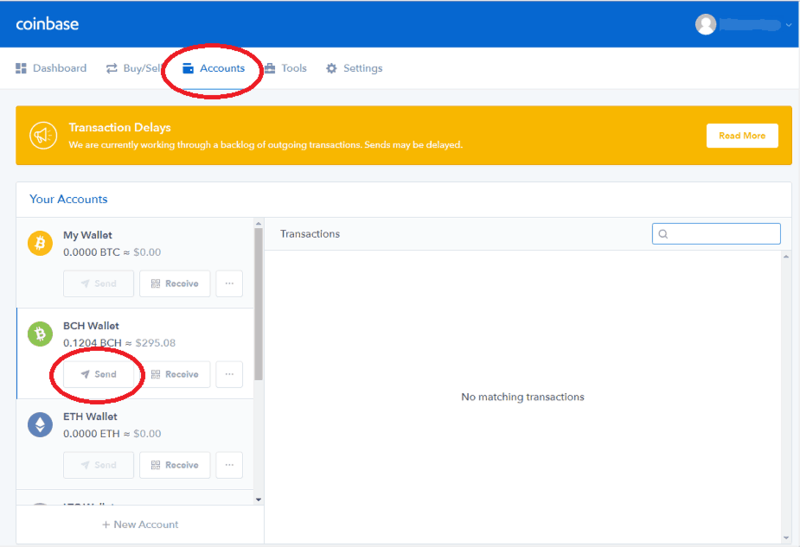 Your money will be available in your bank account by the date specified by Coinbase. In most cases, the money is actually transmitted well in advance of the target date. An additional tool that you may want to utilize after becoming familiar with how crypto works is the Shift debit card. 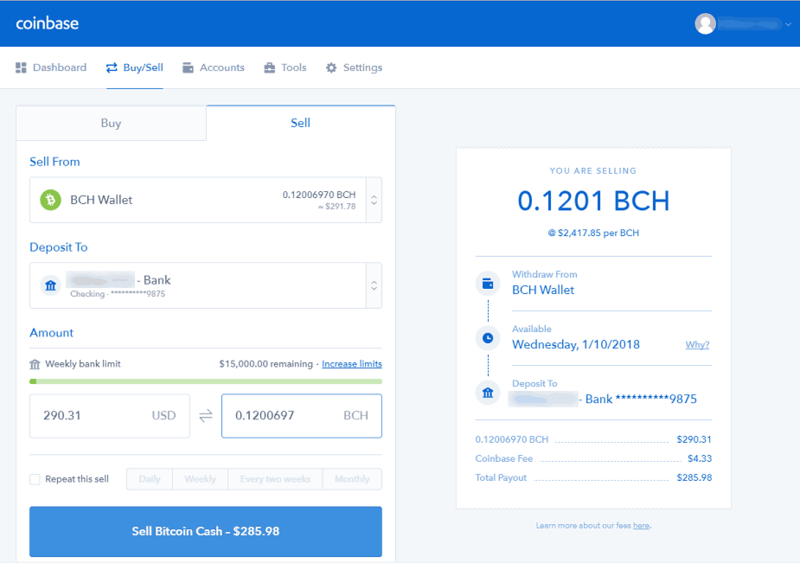 It connects to your Coinbase account to let you spend your Bitcoin Cash balance wherever debit cards are accepted for payment. The Shift card is primarily geared toward those transacting with legacy BTC Bitcoin, but you can change a few settings to make it compatible with Bitcoin Cash BCH digital currency. Consult Google for detailed instructions on how to accomplish this. Every time you buy something with your Shift card, the appropriate amount of BCH is deducted from your Coinbase wallet. There is no charge to use this service for normal purchases, but international use and ATM withdrawals do incur small fees. Residents of most states can sign up for a Shift card, but there are a few parts of the United States that are excluded. You will need to have a free balance of $20 in crypto to pay for card issuance. As long as this is true, you can go to the Shift card website to order your new card today. Similar to the Shift card, the BitPay Visa also enables you to make day-to-day purchases through crypto coins. The major difference is that rather than spending directly from your BCH wallet, BitPay's offering requires that you load your card with Bitcoin Cash in advance. Your digital money is converted to USD at the time you put it into your card balance. The BitPay Visa card is available in all 50 states. To find out more and view illustrated, step-by-step instructions on how to sign up for a BitPay Visa, check out our thorough BitPay Visa review. Bitcoin Cash is a crypto-currency that was split off of its ancestor Bitcoin on Aug.1, 2017. There had been discussions within the Bitcoin community for years about how to scale the coin up to meet increasing demand. However, no solid consensus was reached, and fees continued to rise while transaction timeframes increased. Bitcoin Cash was formed to attempt to resolve these issues. What are the differences between legacy Bitcoin and Bitcoin Cash? If I had bitcoins on Aug. 1 2017, do I have Bitcoin Cash? All holders of Bitcoin at the time of the BCH split received an equal amount of Bitcoin Cash. Anyone who has access to his or her private keys can follow the instructions for splitting coins to claim the new crypto coin. Many organizations that safeguard their users' private keys have opted to credit customers with their BCH automatically. However, other entities haven't done so whether through negligence or because they ran a cost-benefit analysis and acted accordingly. This demonstrates the value of controlling one's own private keys, like you do at blockchain.com. Why should I use Bitcoin Cash? Fees on the original Bitcoin Network have skyrocketed to the point where they represent a sizeable fraction of the money transferred unless you're in the habit of moving tens of thousands of dollars around at a single time. You can skimp on these fees to keep expenses low, but this subjects you to unpredictable delays until your transaction is confirmed. Bitcoin Cash has much lower fees, so it's more practical for the majority of users. Mining equipment manufacturer BitMain and crypto-currency mining pool ViaBTC were two of the big names behind Bitcoin Cash, but there's no single official development team like there is with traditional Bitcoin. Instead, there are a handful of independent teams that coordinate their efforts. This allows them to try various experiments and then compare notes to come to a consensus as to the best way to proceed. Will I play poker (or bet on sports and casino games) directly with Bitcoin Cash? As of December 2017, there are no popular online gaming firms that allow users to place wagers directly in Bitcoin Cash. Instead, they convert any BCH you deposit into fiat currency typically U.S. dollars. You'll then conduct all your gambling in dollars, just like the users who deposited initially via other means than crypto coins. When you make a withdrawal, your dollars will be exchanged back into Bitcoin Cash at current market rates and sent to your BCH wallet. Will I be able to play poker or place bets without submitting my personal documents? The sites we work with that support Bitcoin Cash are all government-licensed and -regulated enterprises. Thus, they must remain in compliance with all relevant anti-money laundering and Know Your Customer (KYC) laws. You will probably be asked to submit personally identifying paperwork at the time of your first cashout to verify that you are who you claim to be. You'll only have to do this once because your documents will remain on file with the poker site, and they won't need to ask you for your ID again unless you move or your personal details change. Why does my BCH receiving address change with each transaction? 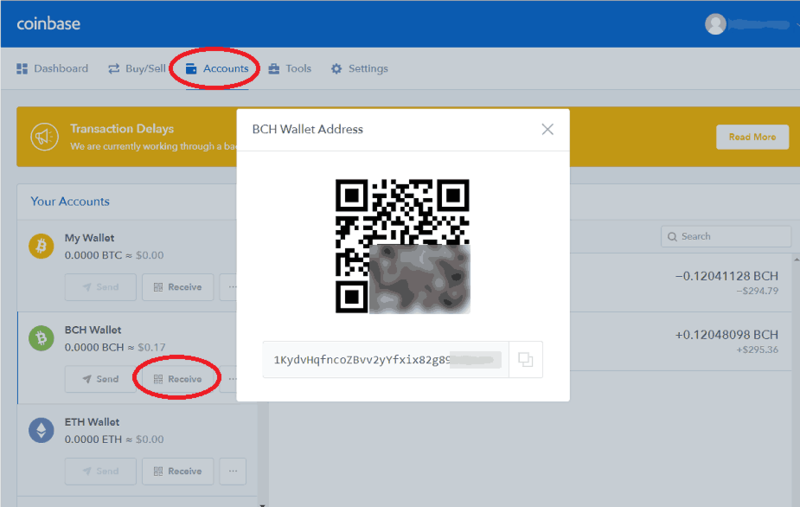 It's standard for wallets to generate new receiving addresses for each BCH transaction. This is a security measure that prevents anyone from observing any long-term patterns in your Bitcoin Cash usage. While it's difficult to establish the identity of anyone who owns a Bitcoin Cash address, tracking multiple transfers of BCH going to the same address makes it easier for those who wish to pry into your affairs. It's possible to reuse the same Bitcoin Cash addresses more than once, but we advise you to stick with the normal method of creating a new address each time you want to receive the digital crypto-currency. Blockchain.com and Coinbase automatically generate a new address for each transaction. Nobody can tie all your transactions together at a glance by examining the public blockchain ledger. Permalink Submitted by Coinbase Pro Tips (not verified) on Sat, 01/27/2018 - 17:40. Fortunately, they are just giving me a warning and not closing my account outright, but you might not be so lucky. It's not worth the risk; better to move your coins off of Coinbase first before trying to gamble with them.